Afghanistan must work with Pakistan to defeat Islamic militants, President Hamid Karzai has told hundreds of tribal leaders at a key peace summit. The Afghan leader was opening the three-day "peace jirga" or tribal council, on combating the Taleban and al-Qaeda, in the Afghan capital Kabul. He told 700 Afghan and Pakistani delegates of their "common destiny". Pakistani President Pervez Musharraf, who was to attend, had pulled out citing other commitments. But Mr Karzai was upbeat as he opened the jirga - in a huge tent - saying it brought together "brother nations". "I am confident, I believe... if both Afghanistan and Pakistan put their hands together, we will eliminate in one day oppression against both nations," he said. 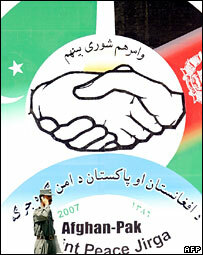 "If the problem is from the Afghanistan side, we should seek ways to solve it. If the problem is in Pakistan, we should find solutions for it. "Our future and our destiny is intertwined," he said. Although the Afghan president did not mention the recent kidnapping of a group of South Koreans, he denounced the kidnapping of women. "Never in Afghanistan's history has anyone kidnapped women. Even robbers would back off when they found women in a caravan, respecting their dignity and honour." Afghans react to the "peace jirga"
Pakistani Prime Minister Shaukat Aziz - who came to the meeting instead of President Musharraf - welcomed President Karzai's comments. "Terrorism, militancy, the violent creed preached by al-Qaeda, extremism and Talebanisation represent pain, intolerance and backwardness in our societies and a phenomenon that has maligned our great and noble faith, Islam," he said. "They are not the future of Pakistan or Afghanistan. We must fight these dark forces with determination and resolve," he said. Afghan officials often accuse Pakistan of harbouring Taleban and al-Qaeda fighters, but Islamabad has strongly denied the charge, pointing out that it has arrested several senior militant leaders and is battling its own Taleban threat in its tribal areas. Around 175 Pakistani officials, politicians and tribal elders are attending the jirga. However, tribal elders from Waziristan, the Pakistani region from which much of the instability stems, refused to attend. The BBC's Alistair Leithead in Kabul says that must mean there will be questions over just how much of a difference the jirga can make in reducing the effectiveness of the insurgents that operate across the border. The idea of a joint Afghan-Pakistan peace jirga was first suggested by Mr Karzai during talks with US President George W Bush in September. Supporters of the Taleban say talks that do not include them could be futile. Abdul Ghafoor Haideri, secretary general of Pakistan's Jamiat Ulema-e-Islam (JUI) told the Associated Press news agency: "This is only a display, which cannot produce the true views of the Afghan people."